A beautiful summer evening is the perfect opportunity for an impromptu cocktail hour with your friends and neighbors… but not if your drinks are warm. When you don’t have time to chill your beverages in the refrigerator, it’s Cooper Cooler to the rescue. Just add ice cubes and water, insert a bottle or can, set the dial, and hit the start button. Cooper Cooler circulates icy cold water and rotates the beverage container to quickly cool the internal contents. Carbonated beverages won’t explode after being chilled in the Cooper Cooler, since the containers are rotated, not shaken. If you’re worried about agitating the contents of a wine bottle, you can select the no-spin mode. The inventor is Greg Loibl, who came up with the idea in 1992 while completing his undergraduate studies at Cooper Union. Later, while working on his thesis for a master’s degree in chemical engineering, Greg refined the design and built a prototype. 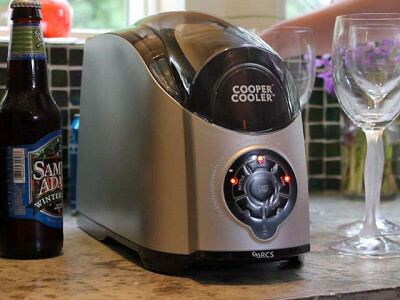 Greg and his faculty advisors, Irv Brazinsky and George Sidebotham, received a patent for the Cooper Cooling Process, and a number of ambitious Cooper Union students pitched in and contributed their engineering and design talents to the launch of the Cooper Cooler. The rest is icy cold history. What happens when you have a case of warm beer and thirsty guests? Has this ever happened to you? It was that one particular evening, that inspired this Grommet, and a start-up company. To quote Tom Edison, an idea is "1% inspiration, and 99% perspiration." The idea was spawned when I was a student at the Cooper Union. I convinced my advisors that I could do a Master's Thesis on developing a new way to chill beverage quickly. After 978 beverages, 2 years of hard work, I developed a product that could chill a 12oz can from 25C to 5C in 45 seconds. A patent was filed and the Cooper Cooling Process was born. It took eight more years to finally launch our first product, which has been featured here today. We called it the Cooper Cooler as a dedication to Peter Cooper, who is the founder of the Cooper Union for the Advancement of Science and Art. I am excited to be choosen as a Daily Grommet, and am happy to share my experience with you today. Please feel free to forward your questions, comments, and I will be happy to answer them today. I'm sorry, but paying this kind of money (and the energy this money represents) for a product that uses electricity - and ice that another electricity-consuming device had to create, as well as the energy required to create this product - in order to chill a single drink reflects the kind of energy-consumptive thinking that has America and the world in its current state. May it go the way of the electric-raclette maker and the hot-dogger . . . Thank you for your input. However, I do not agree with your opinion. Many homes across America have separate refrigeration systems for wine, beer, etc. You see, these beverages can all be stored warm or at cellar temperature, and then chilled when needed. If you look at it from this point of view, the unit can actually replace a second refrigeration system, save electric, and reduce refrigerator space or size. If every non-perishable beverage were stored warm and chilled as needed, America would save billions of dollars in energy. This was an actual study we did. I guess I'm not in alignment with the dedicated 'beverage refrigerators' dotting America either, Greg - but I take your point. Why have 2 separate models? 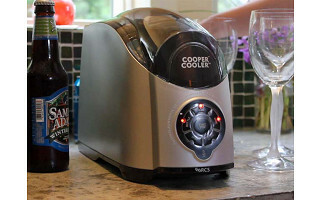 How about a converter instead so you can just purchase 1 Cooper Cooler. Then I might consider the price reasonable. A power adaptor that works on any 120VAC outlet. And a 12 foot cigarette adaptor. There is a jack in the back of the unit, whereby you can interexchange plugs. Thanks for the info. Tried to find out more specifics on website but that information was not included. (at least I couldn't find it). Thanks again. I absolutely love the idea of having a cold beverage at my finger tips any time I want and not having to wait an hour or longer for my soda or wine to chill in the fridge. I'm thinking that this would make a great Christmas present for my husband. Good Work Greg!!! A beautiful summer evening is the perfect opportunity for an impromptu cocktail hour with your friends and neighbors… but not if your drinks are warm. When you don’t have time to chill your beverages in the refrigerator, it’s Cooper Cooler to the rescue. Just add ice cubes and water, insert a bottle or can, set the dial, and hit the start button. Cooper Cooler circulates icy cold water and rotates the beverage container to quickly cool the internal contents. Carbonated beverages won’t explode after being chilled in the Cooper Cooler, since the containers are rotated, not shaken. If you’re worried about agitating the contents of a wine bottle, you can select the no-spin mode.